Despite his obvious talent for music it was only with the greatest difficulty that Granville Bantock persuaded his father to allow him to study at the Royal Academy of Music. His father had a point: the career of a musician in Victorian England was by no means certain, and certainly not a suitable profession for the son of an eminent London surgeon. But the young Bantock, already a prolific composer, had his way. He entered the Royal Academy in September 1889 and began to study under the direction of Sir Frederick Corder (1852–1932), a composer of progressive sympathies who was also to number Holbrooke and Bax among his pupils. On leaving the Academy in 1893 Bantock endured various musical hack jobs, of which conducting proved to be the most important. For a while he directed musical comedies for the impresario George Edwardes. This experience led to an appointment as Musical Director of The Tower, New Brighton, where from 1897 to 1900 he proceeded to astonish Merseyside holiday-makers with concerts that included not only the major classics (they were accustomed to a diet of foot-tapping marches and waltzes), but also the music of contemporary British and Continental composers. In 1900 he turned his attention to musical education, becoming Principal of the Birmingham and Midland Institute of Music, and in 1908 Peyton Professor of Music at Birmingham University in succession to Sir Edward Elgar. In both capacities, as in everything he did, Bantock made a lively and indelible impression. As might be expected of a man of exceptionally wide culture, boundless curiosity, and unlimited energy, Bantock was a composer of works that were not only on the largest scale, but also heroic and exotic in theme. He was much influenced by Liszt and Wagner and it is significant that his most successful works were those that depended either upon words or were illustrative of some poetic or dramatic programme. Typical are the six tone poems he composed between 1900 and 1902, of which Fifine at the Fair is third in order of composition. Almost all his orchestral works, whether or not they are actually labelled ‘tone poems’, have a strong programmatic underlay: this was an age when composers revelled in the descriptive powers of music and had no economic inhibitions about the size of orchestras. Not for nothing was he a friend and admirer of Richard Strauss. Unlike Strauss, however, the themes that inspired Bantock were often exotic: tales of the Orient, tales of Celtic and Classical mythology—tales, in short, to compensate for life in prosaic, materialistic Britain. The Pagan Symphony is a case in point. Here Bantock’s dream is of classical antiquity. According to his daughter, Myrrha, he began work on the symphony in 1923. The published orchestral score, however, firmly attaches the date 3 September 1927 (and the place, Paris) to the first bar, and 20 June 1928 to the last, some 1,046 bars later. It may well be that the initial sketches were made at the earlier date, but it is clear that the final details and orchestration belong to 1927/28. As with the Hebridean Symphony (1913) and the Celtic Symphony (1940), the Pagan Symphony is cast in one continuous movement which falls into a number of sections which provide the element of contrast that is characteristic of the separate movements of traditional symphonic form. Bacchus I have seen on far-off rocks—if posterity will believe me—teaching his songs divine to the listening Nymphs and to the goat-footed Satyrs with their pointed ears. The music may be described as a vision of the past, when the Greek god Dionysus (Bacchus) was worshipped as the bestower of happiness and plenty, the lover of truth and beauty, the victor over the powers of evil. Immortal Aphrodite of the broidered throne appears for a brief moment as the goddess of Love, to remind the world of her supreme power and glorious beauty. Beyond this, interpretation must be left to the imagination of the listener—always bearing in mind that music, however descriptive, also develops according to its own laws and therefore without any precise reference to any ‘programme’ that may be on offer. The elements that are actually signposted in the score provide sufficient clue to the work’s overall structure and meaning. It begins with a slow introduction (Tranquillo molto lento sostenuto) which sets out the thematic material for the entire work in an evocation of pastoral calm and classical nobility. This leads to a more positive section (Allegro con spirito), the equivalent of the normal symphonic first movement. The third section, a scherzo, is described by the composer as a ‘Dance of Satyrs’. The fourth section, labelled Fanfare, quickly evolves into an antique dance (Allegretto con moto). This is followed by a sensuous evocation of the goddess Aphrodite (Molto lento, sostenuto e rubato), inscribed by the composer with a line from a poem by Sappho: ‘Poiliothron athanat Aphrodita’ (‘Immortal Aphrodite on your elaborate throne’). The finale (Allegro moto e con fuoco) brings about a triumphant musical summing-up of everything that has gone before. Each section grows naturally out of its predecessor; and though they explore a variety of changing moods, each section is a marvellous evocation of the Arcadian vision that Bantock has ascribed to it. More important is the fact that every scrap of what may at first seem a plethora of thematic material grows organically out of a limited number of ideas that are in themselves quite simple. To appreciate this it is necessary to become acquainted with five themes that open the introductory section. The first is an innocuous downward modal scale presented in the strings, divided and muted. Scales, ascending and descending, plainly stated or disguised by additional motivic figuration, form an important part of Bantock’s thematic argument. Next comes a short flute motif, part fanfare, part birdsong. This, in a variety of manifestations, is perhaps the most important thematic element in the symphony, its interlocking fourths and fifths informing nearly every other motif. The brief horn-call that follows also plays its part—usually in the more triumphant passages of the Symphony. It is followed by a sinuous melody for cellos and bassoons, related to the flute motif. Out of it grows the fifth and final motif: a yearning melody for solo violin. It is not the intrinsic quality of these themes that matters but what Bantock does with them. The entire Symphony is a masterly demonstration of the Lisztian art of thematic transformation. Moreover, the dramatic and pictorial moods that each transformation conjures up are extremely potent. The music engages the imagination and emotions as thoroughly as it may satisfy the intellect. The limpid beauty of the dance section: flutes in thirds describing a primitive but hypnotic melody (derived from the horn-calls of the introduction) that floats above a gentle thrumming of harp and pizzicato strings. The wonderfully grotesque yet good-humoured ‘Dance of Satyrs’: a fugal texture derived from the flute motif and ingeniously scored, in a maze of interlocking, imitative phrases, for woodwind and brass, and culminating in a thunderous climax for percussion. This is music of the highest imagination and it is a matter for astonishment that the work has been largely neglected since Sir Adrian Boult and the BBC Symphony Orchestra gave the first performance in 1936. 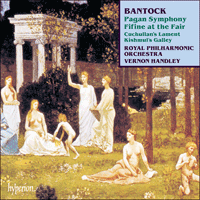 The tone poem Fifine at the Fair, however, became one of Bantock’s more frequently performed works. There is some uncertainty as to the actual date of composition. Most authorities give it as 1901, but the published score clearly states August–November, 1911. It seems likely that Bantock undertook a radical revision of an earlier work—even dropping the description ‘tone poem’ in favour of ‘Orchestral Drama’, tone poems having passed their heyday by 1911. He intended the work to be performed by the Royal Philharmonic Society who had asked for something for their 1912 season. Unfortunately the Society found itself unable to meet the fee he demanded, and the first performance therefore took place on 2 October 1912 at the Birmingham Festival in an ambitious concert that included Strauss’s Don Quixote and the first performance of Walford Davies’s Song of St Francis. A Philharmonic Society performance eventually took place on 26 December 1917 under the direction of Mr Thomas Beecham. Indeed, the work became something of a favourite with Beecham—though when he recorded it for HMV in 1949 he introduced several cuts which, though minor, disturbed its formal balance. The present recording is therefore the first that accounts for every note. Bantock took as his starting point a poem by Robert Browning (1821–89) which critics of the time (the 1870s) considered, not without reason, to be almost unreadable. Dimly, however, buried beneath inordinate length, tortuous syntax and endless digressions, the determined reader may discern a story line in which the narrator is first pictured afloat on the ‘sea of life’, comfortable and secure but disturbed by the presence of a butterfly, symbol of freedom and adventure. That adventure is described in the main body of the poem: the scene, a fairground; the adventure, a dancer, Fifine, with whom the narrator becomes infatuated. He forgets his wife Elvire, and scorns the predictable comforts of domestic life, but is gradually forced to realize their true value as it becomes clear that the wayward Fifine can offer no lasting happiness. Elvire forgives her errant spouse who, as Browning points out in verse 129, has learned his lesson. In musical terms Bantock follows Browning’s ground plan faithfully, though without his obscurity and prolixity. The Prologue, labelled (as in Browning’s poem) ‘Amphibian’, suggests, by means of a string section divided into twenty-one parts, a suitably watery ambience. It begins in virtual silence and only gradually takes on thematic definition with the emergence of a gently articulated motif (a rise and fall over a semitone) that will later blossom as the expression of Elvire’s steadfast love. Above the undulating background there hovers a fluttering ‘butterfly’ motif in the upper strings which prefigures the temptation that Fifine herself will pose. Passages for solo viola, in the manner of a recitative, suggest the narrator’s restless yearning for something other than the womb-like security in which he is immersed. Having set out the basis of the dramatic argument and underpinned it with hints of the conflicting Fifine and Elvire themes, Bantock, like Browning, embarks upon the story itself. This is set against the turbulent background of a Fair—literally a ‘Carnival of Venice’, as brief references to that famous tune make clear. The hearty thump of a showman’s drum is heard (a moment uncannily reminiscent of Petrushka, though it seems unlikely that Bantock attended the Paris premiere in June 1911 immediately before commencing his own composition) and is followed by an itinerant fiddler’s trivial tune (to be played, Bantock directs, in the ‘first position’) and the sound of a penny whistle. The carnival, which may be thought of as a symbol of the bustling world itself, proceeds apace until interrupted by the appearance of Fifine in the form of a wayward clarinet solo as prelude to her seductive dance (Allegretto grazioso e capriccioso). Over a sinuous melody in the cellos the clarinet weaves teasing arabesques described by a bemused Musical Times critic (November 1911) as Fifine’s ‘saltatory seductions’—a phrase which may needlessly have over-excited his readers. Little by little the music becomes more passionate as the narrator grows more and more infatuated. The love scene is interrupted by an elaborate clarinet cadenza so demanding and flirtatious as to unnerve the narrator and remind him of the dependability of his wife’s love. It is her theme that now overwhelms him in a passage of great warmth and beauty for strings and horns. Further references are made to Fifine and the Fair, but all ends in disaster. There now begins the final section of the work (Lento con malinconia—an Epilogue growing out of a broken-backed version of Elvire’s theme, presented fugally by the cellos. Gradually the music takes heart and comes to a triumphant expression of Elvire’s love. But if the transgressor is forgiven, an unexpectedly plangent penultimate chord suggest a lingering regret for what has been lost. Not for nothing did Bantock, unlike Browning, subtitle his work ‘A Defence of Inconstancy’! Throughout his career Bantock was fascinated by Celtic mythology. The publication of Marjory Kennedy-Fraser's collections of Songs of the Hebrides focused his interest and provided thematic fuel for its musical expression. The two-act opera The Seal Woman (1924), the Hebridean Symphony (1913), and the Celtic Symphony (1940) are the most powerful and sustained expressions of this fruitful obsession. But there are lesser examples, and the Heroic Ballads, completed on 19 and 24 November 1944, respectively, are two of them. Both are built on songs from the Kennedy-Fraser collections. ‘Cuchullan’s Lament for his Son’ is to be found in Volume 2 (1917), as noted down by Kenneth Macleod from the singer Duncan Maclellan; and ‘Kishmul’s Galley’ in Volume 1 (1909), as collected by Marjory Kennedy-Fraser from the singing of Mary Macdonald on the island of Mingulay, Outer Hebrides. Woe is me! my son a-keening! Who lieth asleep in cold death. Again the melody, heard first on the horns, provides thematic material for the entire movement, which grows organically in a wild, sea-tossed vision of ancient heroes and heroic splendour. Malgré l’évidence de ses dons pour la musique, ce n’est qu’avec la plus grande difficulté que Granville Bantock réussit à persuader son père de lui permettre de continuer ses études à la Royal Academy of Music. Son père n’avait pas entièrement tort: la carrière de musicien n’offrait aucune certitude de succès, à l’époque de la reine Victoria en Angleterre, et n’était certainement pas une profession convenable pour le fils d’un éminent chirurgien londonien. Mais le jeune Bantock, qui était déjà un compositeur prolifique, eut raison de toutes les difficultés. Il entra à la Royal Academy en septembre 1889 et commença ses études sous la direction de Sir Frederick Corder (1852–1932). Ce compositeur, aux sympathies progressistes, eut aussi pour élèves Holbrooke et Bax. En quittant l’Academy en 1893, Bantock dut endurer une série de petits emplois musicaux, dont le plus important s’avéra être celui de chef d’orchestre. Il dirigea pendant quelque temps des comédies musicales pour l’imprésario George Edwardes. Grâce à cette expérience, il fut nommé Directeur musical de «La Tour», à New Brighton, près de Liverpool, où de 1897 à 1900, il stupéfia les vacanciers de Merseyside (qui avaient été accoutumés à un programme de valses et de marches qu’ils pouvaient scander du pied) avec des concerts qui comprenaient non seulement les principaux classiques, mais aussi la musique de compositeurs britanniques et européens contemporains. En 1900, l’éducation musicale attira son attention; il devint Directeur de l’Institut de Musique de Birmingham et des Midlands, et en 1908, Peyton Professeur de Musique à l’Université de Birmingham, succédant à Sir Edward Elgar. Dans l’accomplissement de ces deux fonctions, comme dans tout ce qu’il faisait, Bantock laissa une vive et inoubliable impression. Comme on peut s’attendre de la part d’un homme exceptionnellement cultivé et d’une curiosité et d’une énergie sans limites, Bantock était le compositeur d’œuvres de très grand format, mais aussi sur des thèmes héroïques et exotiques. Liszt et Wagner avaient eu une grande influence sur lui, et il est significatif que ses œuvres les plus populaires soient celles qui dépendaient soit des paroles soit de l’illustration de quelque «programme» poétique ou dramatique. Les six poèmes symphoniques qu’il composa entre 1900 et 1902 sont typiques; Fifine à la foire est le troisième dans l’ordre de composition. Presque toutes ses œuvres orchestrales, qu’elles portent ou non le titre de «poèmes symphoniques» ont une solide base descriptive: c’était une époque où les compositeurs se délectaient des possibilités descriptives de la musique et ne faisaient face à aucune difficulté économique concernant la taille des orchestres. Bantock n’était pas pour rien l’ami de Richard Strauss! Cependant, à la différence de celui-ci, c’étaient souvent des thèmes exotiques qui inspiraient Bantock: des contes orientaux, des contes de mythologie celte et classique—des contes, en bref, pour compenser le prosaïsme et le matérialisme de la vie de l’époque en Angleterre. La Symphonie païenne en est un excellent exemple. Ici Bantock situe son rêve dans la période d’antiquité classique. Selon sa fille, Myrrha, il commença à travailler à cette symphonie en 1923. La partition orchestrale publiée porte, cependant, fermement attachée à la première mesure, la date du 3 septembre 1927 (ainsi que l’endroit, Paris) et quelques 1046 mesures plus loin, sur la dernière de celles-ci, la date du 20 juin 1928. Il est fort possible que les premières esquisses aient été composées à la première date, mais les derniers détails et l’orchestration sont de 1927/28. Tout comme la Symphonie des Hébrides (1913) et la Symphonie celtique (1940) la Symphonie païenne consiste en un mouvement continu divisé en un nombre de sections qui offrent l’élément de contraste caractéristique des mouvements indépendants de la forme symphonique traditionnelle. J’ai vu Bacchus sur des roches lointaines—si la postérité veut bien me croire—qui enseignait ses chants divins aux Nymphes attentives et aux Satyres aux pieds de bouc et aux oreilles pointues. On peut décrire la musique comme une vision du passé, quand le dieu grec Dionysus (Bacchus) était adoré comme le dieu qui conférait l’abondance et le bonheur, celui qui aimait la vérité et la beauté, celui qui était victorieux sur les puissances du Mal. L’immortelle Aphrodite sur son trône orné paraît pendant un bref instant comme la déesse de l’Amour, pour rappeler au monde son pouvoir suprême et sa glorieuse beauté. À part ces quelques lignes, l’interprétation de la musique est laissée à l’imagination de l’auditeur—sans jamais oublier que, pour descriptive qu’elle soit, la musique se développe aussi selon ses propres lois et donc sans tenir particulièrement compte d’aucun «programme» offert. Les éléments qui sont en fait indiqués dans la partition offrent suffisamment d’indices sur la structure d’ensemble de l’œuvre et sur son sens. Elle commence par une lente introduction (Tranquillo molto lento sostenuto) qui présente le matériel thématique de l’œuvre entière dans une évocation de calme pastoral et de noblesse classique. Ceci mène à une section plus positive (Allegro con spirito), l’équivalent du premier mouvement symphonique habituel. La troisième section, un scherzo, est décrite par le compositeur comme une «Danse des satyres». La quatrième section, sous le titre Fanfare se développe rapidement en une danse antique (Allegretto con moto). Vient ensuite une voluptueuse évocation de la déesse Aphrodite (Molto lento, sostenuto e rubato) sur laquelle le compositeur a inscrit un vers d’un poème de Sappho: «Poiliothron athanat Aphrodita» («Immortelle Aphrodite sur ton trône orné»). Le finale (Allegro molto e con fuoco) accomplit un triomphant résumé musical de tout ce qui précède. Chaque section succède naturellement à la précédente; et bien qu’elles explorent une variété d’humeurs changeantes, chacune est une merveilleuse évocation de la vision arcadienne que Bantock a attribuée à cette musique. Ce qui est plus important est le fait que le moindre fragment de ce qui peut, à première vue, sembler être une pléthore de matériel thématique a son origine fondamentale dans un nombre limité d’idées qui sont, elles-mêmes, très simples. Pour apprécier ceci, il faut découvrir les cinq thèmes qui ouvrent la section initiale. Le premier est une gamme modale descendante inoffensive, que présentent les cordes, divisées et en sourdine. Les gammes, montantes et descendantes, formulées tout simplement ou déguisées par une figuration de motif supplémentaire, forment une partie importante de l’argument thématique de Bantock. Vient ensuite un bref motif de flûte, mi-fanfare, mi-chant d’oiseaux. Ce motif, dans une variété de formes, est peut-être l’élément thématique le plus important de la symphonie, ses quartes et quintes entrecroisées imprégnant presque tous les autres motifs. Le bref appel de cor qui suit, a aussi son rôle—généralement dans les passages plus triomphants de la symphonie. Il est suivi par une sinueuse mélodie pour violoncelles et bassons, qui est relative au motif de flûte. Il en sort le cinquième et dernier motif, une ardente mélodie pour violon solo. Ce qui est important, ce n’est pas la qualité intrinsèque de ces thèmes, mais ce que Bantock en fait. L’entière symphonie est une démonstration magistrale de l’art Lisztien de transformation thématique. Qui plus est, les humeurs dramatiques et descriptives que chaque transformation évoque sont extrêmement puissantes. La musique séduit l’imagination et les émotions aussi profondément qu’elle satisfait l’intelligence. La beauté limpide de la section de danse: flûtes en tierces décrivant une mélodie primitive mais hypnotique (dérivée des appels de cor du début) qui plane au-dessus des légers pincements de la harpe et des cordes pizzicato. La «Danse des satyres», merveilleusement grotesque, bien que pleine de bonne humeur: une texture fugale dérivée du motif de flûte et ingénieusement orchestrée, dans un labyrinthe de phrases imitatives s’entrecroisant, pour les cuivres et instruments à vent, qui culmine dans une apogée étourdissante de la percussion. C’est une musique dont l’invention est si riche que l’on ne peut que s’étonner que cette œuvre soit demeurée pratiquement oubliée jusqu’à ce que Sir Adrian Boult et l’Orchestre Symphonique de la BBC n’en donne la première audition en 1936. Le poème symphonique Fifine à la foire, par contre, devint l’une des œuvres de Bantock les plus populaires. La date de sa composition donne lieu à quelque incertitude. 1901 est celle généralement acceptée par la plupart des autorités musicales, mais la partition publiée indique clairement août–septembre 1911. Il semble probable que Bantock entreprit la révision radicale d’une œuvre précédente—il changea même la description «poème symphonique» en faveur de «drame instrumental»; les poèmes symphoniques avaient connu leur plus grande vogue en 1911. La Royal Philharmonic Society lui avait demandé de composer quelque chose pour leur saison de 1912 et c’est cette pièce qu’il leur destinait. Malheureusement, la Society se trouva dans l’impossibilité de payer le prix que demandait Bantock, et la première audition eut donc lieu le 2 octobre 1912, au Festival de Birmingham, dans un concert ambitieux qui comprenait aussi le Don Quichotte de Strauss et la première audition du Chant de St François de Walford Davies. La Société Philharmonique l’interpréta finalement le 26 décembre 1917, sous la direction de Thomas Beecham. Cette œuvre devint même une des préférées de Beecham—bien que, lors de l’enregistrement qu’il en fit pour HMV en 1949, il ait introduit plusieurs coupures qui, pour mineures qu’elles soient, rompent néanmoins l’harmonie de sa forme. L’enregistrement actuel est donc le premier à présenter cette œuvre intégralement. Bantock choisit comme inspiration un poème de Robert Browning (1821–89) que les critiques de l’époque (les années 1870) considéraient, assez justement, comme presque impossible à lire. Pourtant, le lecteur déterminé peut vaguement discerner, enfoui sous une longueur excessive, une tortueuse syntaxe et des digressions sans fins, une histoire dans laquelle le narrateur figure tout d’abord flottant sur «l’océan de la vie» agréablement et tranquillement, mais gêné par la présence d’un papillon, symbole de liberté et d’aventure. Aventure que la partie principale du poème raconte: la scène, un champ de foire; l’aventure, une danseuse, Fifine, dont le narrateur tombe amoureux. Il oublie sa femme Elvire, et dédaigne les plaisirs sages de la vie domestique, mais il est peu à peu obligé de reconnaître leurs vrais mérites lorsqu’il se rend compte qu’il ne peut pas attendre de bonheur durable avec la capricieuse Fifine. Elvire pardonne la liaison de son époux infidèle à qui cela a servi de leçon, comme le fait remarquer Browning au vers 129. En termes musicaux, Bantock ne s’écarte pas du plan de base de Browning, mais sans son obscurité ni sa prolixité. Le Prologue, qui a le même titre que dans le poème de Browning, «Amphibien», suggère, grâce à une section de cordes divisée en vingt et une parties, une ambiance aquatique appropriée. Elle commence pratiquement par un silence et ne se définit thématiquement que peu à peu avec l’émergence d’un motif légèrement articulé (un demi-ton montant et descendant) qui s’épanouira plus loin pour exprimer l’amour fidèle d’Elvire. Au-dessus d’un fond sonore ondulant, un motif papillonnant plane dans les cordes supérieures; il préfigure la tentation que Fifine va représenter. Des passages pour alto solo, à la manière d’un récitatif, suggèrent le désir impatient du narrateur pour autre chose que la chaude sécurité dans laquelle il se sent enfermé. Une fois la base de son argument dramatique exposée et étayée par des allusions aux thèmes opposés de Fifine et d’Elvire, Bantock, tout comme Browning, commence à raconter l’histoire. Sa toile de fond est l’agitation bruyante d’un champ de foire—littéralement un «Carnaval de Venise», que de brèves références à cette mélodie célèbre explicitent. On entend un forain battre vigoureusement du tambour (un moment qui rappelle étrangement Petrouchka, bien qu’il semble peu probable que Bantock ait assisté à sa première à Paris en juin 1911 avant de commencer sa propre composition). Il est suivi d’un violoneux ambulant qui joue un petit air banal (à jouer, selon les instructions de Bantock, en «première position»); puis vient le son d’un flûteau. Le carnaval, qui représente peut-être le symbole du monde plein d’animation, va bon train jusqu’à ce qu’il soit interrompu par un capricieux solo de clarinette (l’apparition de Fifine) en prélude à sa danse de séduction (Allegretto grazioso e capriccioso). Au-dessus d’une sinueuse mélodie dans les violoncelles, la clarinette tisse des arabesques taquines qu’un critique stupéfié du Musical Times (novembre 1911) décrivit comme «les séductions bondissantes» de Fifine—phrase qui peut avoir surexcité inutilement ses lecteurs. Peu à peu la musique devient plus passionnée, comme le narrateur tombe de plus en plus sous le charme de la danseuse. La scène d’amour est interrompue par une cadence élaborée de clarinette si exigeante et si flirteuse qu’elle déroute le narrateur et lui rappelle la sécurité de l’amour de sa femme. Il est maintenant submergé par le thème de sa femme dans un très beau et très chaleureux passage des cordes et des cors. Il y a encore d’autres références à Fifine et à la foire, mais tout finit par un désastre. La partie finale de l’œuvre commence maintenant (Lento con malinconia)—Epilogue qui se développe à partir d’une version simplifiée du thème d’Elvire, présentée en fugue par les violoncelles. Graduellement la musique reprend courage et arrive à une expression triomphante de l’amour d’Elvire. Mais si le mari coupable est pardonné, un avant-dernier accord au retentissement inattendu suggère un regret qui subsiste encore pour ce qui aurait pu être. Il ne faut pas oublier que Bantock, à la différence de Browning, sous-titre son œuvre «Défense de l’inconstance»! Tout au long de sa carrière, Bantock fut fasciné par la mythologie celte. La publication des collections des Chants des Hébrides de Marjory Kennedy-Fraser concentrèrent son intérêt et lui fournirent le matériel thématique pour l’exprimer en musique. L’opéra en deux actes La Femme phoque (1924), la Symphonie des Hébrides (1913), et la Symphonie celte (1940) sont les expressions les plus soutenues et les plus puissantes de cette fructueuse obsession. Mais il y a d’autres exemples moins importants, et les Ballades héroïques, terminées les 19 et 24 novembre 1944 respectivement, en sont deux. Tous deux sont basées sur des chants des collections de Kennedy-Fraser. «La lamentation de Cuchullan pour son fils» se trouve dans le Volume 2 (1917), comme Kenneth Macleod le recopia sur les indications du chanteur Duncan Maclellan; et «La galère de Kishmul» dans le Volume 1 (1909), recueilli par Marjory Kennedy-Fraser d’après les chants de Mary Macdonald, sur l’île de Mingulay. Ô malheureux! je me lamente sur mon fils! Toi qui reposes dans la froide étreinte de la mort. Et regardais voguer la galère de Kishmul. De nouveau la mélodie, que l’on entend tout d’abord sur les cors, fournit le matériel thématique au mouvement tout entier, qui se développe fondamentalement dans une vision sauvage, ballottée par les flots, d’anciens héros et de splendeur héroïque. Trotz seiner offenkundigen musikalischen Begabung konnte Granville Bantock seinen Vater nur mit allergrößter Mühe überreden, ihn an der Royal Academy of Music studieren zu lassen. Sein Vater hatte triftige Gründe: Die Laufbahn eines Musikers war im viktorianischen England keineswegs gesichert und gewiß kein anständiger Broterwerb für den Sohn eines bekannten Londoner Arztes. Doch der junge Bantock, schon damals ein produktiver Komponist, setzte sich durch. Er trat im September 1889 an der Royal Academy an und begann unter Anleitung von Sir Frederick Corder (1852–1932) zu studieren, einem Komponisten mit progressiven Neigungen, der außerdem Joseph Holbrooke und Arnold Bax zu seinen Schülern zählen sollte. Nachdem er 1893 von der Academy abgegangen war, stand Bantock diverse mindere Engagements als Musiker durch, unter denen sich eines als Dirigent am wichtigsten erweisen sollte. Eine Zeitlang dirigierte er für den Impresario George Edwardes musikalische Komödien. Die erworbenen Erfahrungen führten zu seiner Ernennung zum musikalischen Leiter von The Tower in New Brighton (Cheshire), wo er von 1897 bis 1900 Urlauber aus der Region um Liverpool mit Konzerten verblüffte, bei denen nicht nur die wichtigsten Klassiker gespielt wurden (sie waren leichte Kost aus zündenden Märschen und Walzern gewohnt), sondern auch die Musik zeitgenössischer Komponisten aus Großbritannien und Kontinentaleuropa. 1900 wandte er seine Aufmerksamkeit dem Thema Musikerziehung zu und übernahm die Leitung des Birmingham and Midland Institute of Music; 1908 wurde ihm dann in der Nachfolge von Sir Edward Elgar der Peyton-Lehrstuhl für Musik an der Universität Birmingham zuerkannt. In beiden Ämtern hinterließ Bantock, wie bei allem, was er sich vornahm, einen unauslöschlichen Eindruck. Wie von einem Mann mit außergewöhnlich breitgefächerter Bildung, unendlicher Neugier und grenzenloser Energie kaum anders zu erwarten, hat Bantock Werke komponiert, die nicht nur in allergrößtem Maßstab angelegt, sondern auch von der Thematik her heroisch und exotisch sind. Er wurde erheblich von Liszt und Wagner beeinflußt, und es ist bedeutsam, daß seine erfolgreichsten Werke jene waren, die sich entweder auf Texte stützten oder ein poetisches oder dramatisches Programm illustrierten. Typisch dafür sind die sechs Tondichtungen, die er zwischen 1900 und 1902 geschrieben hat, von denen Fifine auf dem Jahrmarkt, was die Reihenfolge ihrer Komposition angeht, die dritte ist. Fast alle seine Orchesterwerke, seien sie mit dem Etikett „Tondichtung“ versehen oder nicht, haben starke programmatische Grundfesten: Dies war eine Epoche, in der Komponisten schwelgerisch die Deskriptivkräfte der Musik nutzten und keine ökonomischen Hemmungen bezüglich der Größe von Orchestern kannten. Nicht umsonst war er ein Freund und Bewunderer von Richard Strauss. Doch im Gegensatz zu Strauss waren die Themen, die Bantock inspirierten, oft exotisch: orientalische Märchen, Sagen aus der keltischen und klassischen Mythologie—kurz gesagt Märchen und Sagen, die einen Ausgleich zum Leben in einem prosaischen, materialistischen Britannien boten. Die Heidnische Sinfonie ist ein Musterbeispiel. Hier träumt Bantock von der klassischen Antike. Seiner Tochter Myrrha zufolge begann er 1923 mit der Arbeit an der Sinfonie. In der veröffentlichten Orchesterpartitur ist dagegen der erste Takt auf das Datum 3. September 1927 (und den Ort Paris) festgelegt, und der letzte—beachtliche 1046 Takte später—auf den 20. Juni 1928. Es mag durchaus sein, daß erste Skizzen bereits zum genannten früheren Zeitpunkt entstanden sind, aber die abschließenden Details und die Orchestrierung stammen eindeutig aus dem Zeitraum 1927/28. Wie die Hebriden-Sinfonie (1913) und die Keltische Sinfonie (1940) ist die Heidnische Sinfonie in einem durchgehenden Satz angelegt, dessen Einzelabschnitte ähnlich für Kontrast sorgen wie die verschiedenen Sätze der herkömmlichen sinfonischen Form. Bacchus, wie er auf fernen Felsen Lieder lehrte, hab ich geschaut—glaubt es, ihr Nachgeborenen—die Nymphen auch, wie sie sie lernten, und die Ohren der bocksfüßigen Satyrn, wie sie sich spitzten. Die Musik könnte als Vision der Vergangenheit beschrieben werden, in welcher der griechische Gott Dionysus (Bacchus) als Spender von Glück und Fülle verehrt wurde, als Liebhaber von Wahrhaftigkeit und Schönheit, als Sieger über die Mächte des Bösen. Die unsterbliche Aphrodite auf reich geschmücktem Thron erscheint einen kurzen Augenblick lang als Göttin der Liebe, um die Welt an ihre überlegene Macht und herrliche Schönheit zu erinnern. Davon abgesehen bleibt jegliche Interpretation der Phantasie des Hörers überlassen—stets unter Beachtung der Tatsache, daß sich Musik, wie deskriptiv sie auch sein mag, immer nach eigenen Gesetzen entfaltet, also ohne genauen Bezug auf ein möglicherweise vorliegendes „Programm“. Was an Programmatischem in der Partitur tatsächlich angeführt ist, bietet ausreichende Hinweise auf die Gesamtstruktur und Bedeutung des Werks. Es beginnt mit einer langsamen Introduktion (Tranquillo molto lento sostenuto), die in pastoraler Stille und klassischer Erhabenheit das thematische Material für das ganze Werk darbringt. Ein eher positiv gestimmter Abschnitt (Allegro con spirito), das Äquivalent zum gewohnten ersten Satz einer Sinfonie, schließt sich an. Der dritte Abschnitt, ein Scherzo, wird vom Komponisten als „Tanz der Satyrn“ bezeichnet. Der vierte mit dem Titel „Fanfare“ entwickelt sich rasch zu einem altertümlichen Tanz (Allegretto con moto). Es folgt eine sinnliche Anrufung der Göttin Aphrodite (Molto lento, sostenuto e rubato), die vom Komponisten mit einer Zeile aus einem Gedicht von Sappho versehen wurde: „Poiliothron athanat Aphrodita“ („Unsterbliche Aphrodite auf deinem schmucken Thron“). Das Finale (Allegro moto e con fuoco) bringt eine triumphale musikalische Zusammenfassung all dessen, was vorangegangen ist. Jeder Abschnitt erwächst auf natürliche Weise aus dem vorherigen; und obwohl sie eine Vielzahl wechselnder Stimmungen erkunden, beschwören die Abschnitte auf das wunderbarste die arkadische Vision herauf, die Bantock ihnen jeweils zugeschrieben hat. Wichtiger jedoch ist die Tatsache, daß jedes Stückchen dessen, was auf den ersten Blick als Überfülle an thematischem Material erscheint, organisch aus einer begrenzten Anzahl von Ideen hervorgeht, die an sich ganz einfach sind. Um das nachzuvollziehen, ist es erforderlich, sich mit fünf Themen vertraut zu machen, die den ersten Abschnitt einleiten. Das erste ist eine unscheinbare, abwärts verlaufende modale Tonleiter, die von unterteilten und gedämpften Streichern vorgetragen wird. Auf- und absteigende Tonleitern, schlicht dargeboten oder durch zusätzliche melodische Figuration kaschiert, machen einen wichtigen Teil von Bantocks thematischer Erörterung aus. Es folgt ein kurzes Flötenmotiv, teils Fanfare, teils Vogelgesang. Dies ist in seinen unterschiedlichen Erscheinungsformen das wohl wichtigste thematische Element der Sinfonie, dessen verzahnte Quarten und Quinten sich praktisch jedem anderen Motiv mitteilen. Auch der anschließende kurze Hornruf erfüllt seine Funktion—meist in den triumphierenderen Passagen der Sinfonie. Es folgt eine geschmeidige Melodie für Celli und Fagotte, die mit dem Flötenmotiv verwandt ist. Aus ihr entwickelt sich das fünfte und letzte Motiv: eine sehnsuchtsvolle Melodie für Solovioline. Dabei kommt es nicht auf das immanente Wesen dieser Themen an, sondern darauf, was Bantock mit ihnen anfängt. Die ganze Sinfonie ist eine meisterhafte Demonstration der Lisztschen Kunst der thematischen Wandlung. Zudem sind die dramatischen und bildhaften Stimmungen, die jede Transformation auf den Plan ruft, ausgesprochen zwingend. Die Musik beschäftigt Einbildungskraft und Empfindungsvermögen so gründlich, wie sie den Intellekt zu befriedigen vermag. Die klare Schönheit der Tanzpassage: Flöten zeichnen in Terzen eine (aus dem Hornruf der Einleitung abgeleitete) primitive, aber hypnotische Melodie, die über sanftem Klimpern von Harfe und Pizzicato-Streichern schwebt. Der herrlich groteske, aber gutgelaunte „Tanz der Satyrn“: eine fugale Struktur, aus dem Flötenmotiv hervorgegangen und genial orchestriert, in einem Gewirr aus verwobenen imitativen Phrasen für Holz- und Blechbläser, gipfelt in einem von Schlaginstrumenten ausgeführten donnernden Höhepunkt. Dies ist Musik von allerhöchster Erfindungsgabe, und man kann nur staunen, daß dieses Werk solange völlig vernachlässigt wurde, bis Sir Adrian Boult und das BBC Symphony Orchestra sie 1936 erstmals aufführten. Die Tondichtung Fifine auf dem Jahrmarkt wurde hingegen eines der meistgespielten Werke Bantocks. Es besteht einige Ungewißheit über die genaue Datierung der Komposition. Die meisten Quellen geben das Jahr 1901 an, doch die publizierte Partitur besagt eindeutig August–November 1911. Höchstwahrscheinlich hat Bantock ein älteres Werk einer radikalen Bearbeitung unterzogen—wobei er sogar den Begriff „Tondichtung“ zugunsten von „Orchesterdrama“ fallen ließ, denn Tondichtungen hatten 1911 ihre Blütezeit längst hinter sich. Er bestimmte das Werk zur Aufführung durch die Royal Philharmonic Society, die um ein Stück für ihre Konzertsaison 1912 gebeten hatte. Doch leider sah sich die Society außerstande, das verlangte Honorar aufzubringen. Aus diesem Grund fand die Uraufführung am 2. Oktober 1912 beim Birmingham Festival statt, im Rahmen eines ambitionierten Konzerts, auf dessen Programm außerdem Strauss’ Don Quixote und die Uraufführung von Walford Davies’ Song of St Francis standen. Zu einer Aufführung durch die Royal Philharmonic Society kam es erst am 26. Dezember 1917 unter der Leitung von Sir Thomas Beecham. Übrigens entwickelte Beecham eine regelrechte Vorliebe für das Werk—obwohl er, als er es 1949 für HMV auf Schallplatte aufnahm, mehrere Kürzungen vornahm, die zwar geringfügig waren, aber das formale Gleichgewicht störten. Die vorliegende Einspielung ist die erste, die jede geschriebene Note wiedergibt. Bantock nahm als Ausgangspunkt ein Gedicht von Robert Browning (1821–1889), das die damalige Kritik (der 1870er Jahre) nicht ohne Grund für so gut wie unlesbar erachtete. Undeutlich und vergraben unter übermäßiger Länge, gewundener Syntax und endlosen Abschweifungen kann der entschlossene Leser aber immerhin einen Handlungsfaden entdecken, der den Erzähler zunächst im „Meer des Lebens“ schwimmend darstellt, behaglich und sicher, aber aufgeschreckt durch die Gegenwart eines Schmetterlings, der Freiheit und Abenteuer symbolisiert. Um dieses Abenteuer geht es im Hauptteil des Gedichts: Schauplatz ist ein Jahrmarkt; das Abenteuer verkörpert eine Tänzerin namens Fifine, in die sich der Erzähler unsterblich verliebt. Er vergißt seine Gemahlin Elvire und verschmäht den allzu gewohnten Komfort des häuslichen Lebens, wird jedoch allmählich gezwungen, seinen wahren Wert einzusehen, als ihm klar wird, daß die leichtfertigte Fifine kein dauerhaftes Glück bieten kann. Elvire verzeiht ihrem abtrünnigen Gemahl, der inzwischen, wie uns Browning im 129. Vers mitteilt, seine Lektion gelernt hat. Musikalisch hält sich Bantock treulich an Brownings Grundplan, jedoch ohne dessen Verschwommenheit und Weitschweifigkeit. Der Prolog mit der (Brownings Gedicht entsprechenden) Überschrift „Amphibisch“ deutet mit Hilfe einer in einundzwanzig Parts aufgeteilten Streichergruppe ein angemessen feuchtes Ambiente an. Er beginnt in fast totaler Stille und nimmt erst thematische Gestalt an, wenn ein sanft artikuliertes Motiv (Auf- und Abstieg über einen Halbton) auftritt, das später zum Ausdruck der standhaften Liebe Elvires erblühen wird. Über dem wogenden Klanghintergrund schwebt ein flatterndes „Schmetterlingsmotiv“ der hohen Streicher; es stellt die Versuchung dar, die Fifines Person bedeuten wird. Rezitativische Passagen für Solobratsche verweisen auf die rastlose Sehnsucht des Erzählers nach etwas anderem als dem sicheren Schoß, in dem er ruht. Nachdem er die Grundsätze der dramatischen Auseinandersetzung dargelegt und mit Andeutungen der gegensätzlichen Themen für Fifine und Elvire untermauert hat, fängt Bantock wie Browning mit der eigentlichen Erzählung an. Diese erfolgt vor dem turbulenten Hintergrund eines Jahrmarkts—eines regelrechten „Karneval von Venedig“, wie der kurze Verweis auf die bekannte Melodie klarmacht. Man hört den beherzten Trommelschlag eines Schaustellers (ein Moment, der auf gespenstische Weise an Petruschka erinnert, obwohl Bantock wohl kaum die Pariser Uraufführung im Juni 1911 besucht haben wird, ehe er seine eigene Komposition in Angriff nahm), gefolgt von der trivialen Fidelmelodie eines fahrenden Musikanten (laut Bantocks Anweisung „in der ersten Lage“ zu spielen) und schrillem Flötenklang. Der Jahrmarkt, den man sich als Symbol des geschäftigen Treibens in der realen Welt denken muß, nimmt seinen Lauf, bis er durch das Erscheinen Fifines in Gestalt eines launischen Klarinettensolos unterbrochen wird, das ihrem verführerischen Tanz (Allegretto grazioso e capriccioso) vorausgeht. Über einer sinnlichen Melodie der Celli webt die Klarinette spielerische Arabesken, die von einem verwirrten Kritiker der Zeitschrift Musical Times (im November 1911) als Fifines „sprunghafte Verführungskünste“ beschrieben wurden—eine Bezeichnung, die seine Leser möglicherweise unnötig erregt haben wird. Allmählich wird die Musik leidenschaftlicher, während sich der Erzähler immer heftiger vernarrt. Die Liebesszene wird von einer kunstvollen Klarinettenkadenz unterbrochen, die so fordernd und aufreizend ist, daß der Erzähler den Mut verliert und an die Verläßlichkeit der Liebe seiner Gemahlin erinnert wird. Es ist ihr Motiv, das ihn nun in einer Passage für Streicher und Hörner überwältigt, die von großer Wärme und Schönheit geprägt ist. Dann wird wieder auf Fifine und den Jahrmarkt verwiesen, aber alles endet katastrophal. Nun beginnt der letzte Abschnitt des Werks (Lento con malinconia—ein Epilog, der einer verstümmelten Version von Elvires Thema entspringt und von den Celli als Fuge vorgetragen wird. Nach und nach faßt sich die Musik ein Herz und gelangt zu einer triumphalen Darlegung von Elvires Liebe. Obwohl dem Sünder verziehen wird, deutet ein unerwartet lauter vorletzter Akkord doch anhaltendes Bedauern darüber an, was verloren ist. Nicht umsonst hat Bantock im Gegensatz zu Browning sein Werk mit dem Untertitel „Plädoyer für die Treulosigkeit“ versehen! Im gesamten Verlauf seiner Karriere war Bantock von keltischer Mythologie fasziniert. Die Publikation von Marjory Kennedy-Frasers Liedanthologien unter dem Titel Songs of the Hebrides fesselte sein Interesse und lieferte den thematischen Antrieb zu dessen musikalischer Umsetzung. Die zweiaktige Oper The Seal Woman (1924) die Hebriden-Sinfonie (1913) und die Keltische Sinfonie (1940) zeugen besonders eindringlich und nachhaltig von dieser fruchtbaren Leidenschaft. Aber es finden sich auch weniger bedeutsame Beispiele, und die Heroischen Balladen, vollendet am 19. und 24. November 1944, sind zwei davon. Beide bauen auf Lieder aus der Kennedy-Fraser-Sammlung auf. „Cuchullan’s Lament for his Son“ entstammt dem zweiten Band (1917), niedergeschrieben von Kenneth Macleod nach dem Vortrag des Sängers Duncan Maclellan, und „Kishmul’s Galley“ dem ersten Band (1909), gesammelt von Marjory Kennedy-Fraser nach der Darbietung von Mary Macdonald auf der Insel Mingulay. Weh mir! Meinen Sohn bewein ich! Der du in kaltem Tod darniederliegst. Und sah Kishmuls Langboot segeln. Wiederum liefert die Melodie, die zunächst von den Hörnern angestimmt wird, das thematische Material für die ganze Komposition, die organisch aus einer ungestümen meerumtosten Vision frühzeitlicher Helden und heroischer Pracht erwächst.